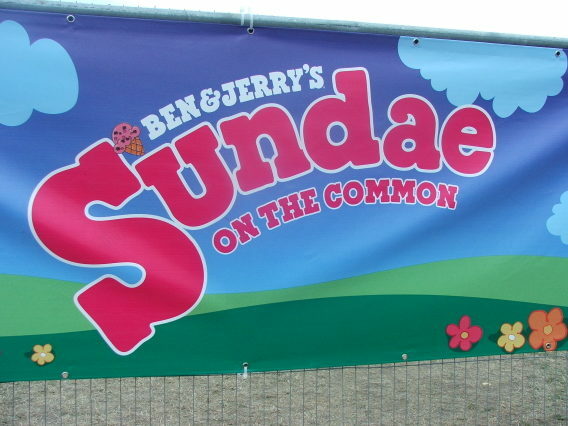 Last Saturday I popped down to Clapham Common for ice cream and music courtesy of Ben & Jerry's. 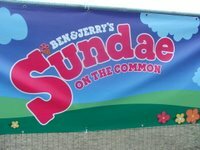 A fiver for a stellar line up, all the free ice cream you could possibly want and sunny (well, at times anyway!) weather that wasn't oppressively hot. A definite formula for success. The first act I caught were South London's Roland Shanks. No, it's not a singer songwriter but a young bunch of (former?) art students signed to Moshi Moshi Records. "With influences ranging from Talking Heads, The Cure to Prince and The Rapture, their angular rhythms and infectious vocal hooks have been making indie kids up and down the UK dance like there was no tomorrow"
Apparently they admit to wearing their influences on their sleeves - does that mean they're just freely admitting to ripping off just about anyone? Either way, I'm not too bothered, they have a bunch of good songs. 'Cutting Teeth' shows Roland Shanks at their best; pulsating bassline+fantastic vocal hook = instant anthem. I don't think they can avoid a Bloc Party comparison but that's not particularly a bad thing. Pity their new single 'Tarantula' sounds a bit tired and uninteresting. While Roland Shanks were an entertaining proposition, follow up act Liam Frost & The Slowdown Family were quite frankly dull and depressing. In fact, it's only because a promo cd was thrust into my hand by an over enthusiastic street teamer that I'm writing about them now. There's been a fair bit of hype about Liam Frost, especially since his backing band (The Slowdown Family) have joined him, but he is a veteran of the Manchester music scene at the tender age of 22. He has been described as "the UK's answer to Bright Eyes" by Guy Garvey of Elbow, which is quite interesting because I think Liam's melancholy vibe makes him sound a bit like Elbow actually. 'Try Try Try' is a more uptempo, almost folky, mandolin led ditty but with seemingly downbeat lyrics (literary analysis was never my strong point - what's he on about?!). Listen to new single 'The City Is At Standstill' on MySpace (link) and you can preorder it on Townsend Records (link).